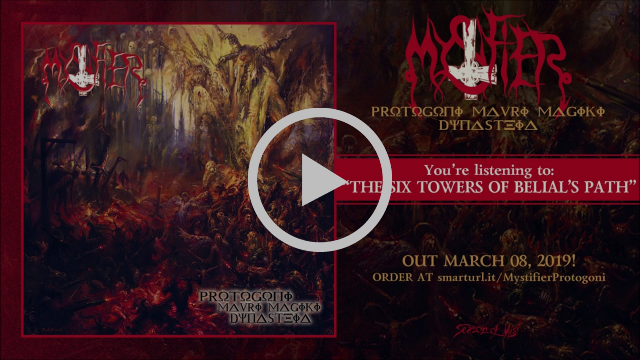 The Brazilian black metal underground stalwarts of MYSTIFIER are now premiering the second new track of their new full length ‘Protogoni Mavri Magiki Dynasteia’, which will be released on March 8th 2019. The next offering named “The Six Towers of Belial’s Path” is now streaming via the official Season of Mist YouTube channel at the link below. “Today is my Birthday my metal friends, and you will get a gift (from Darkness) too. Let’s celebrate this day by listening to another song from our upcoming album to be released on Season of Mist on March 8th. May our day be wonderful and may you celebrate 1.666 birthdays for many years to come with me. But don’t forget that there is one important challenge to complete today… Follow the Six Towers of Belial’s Path!”. 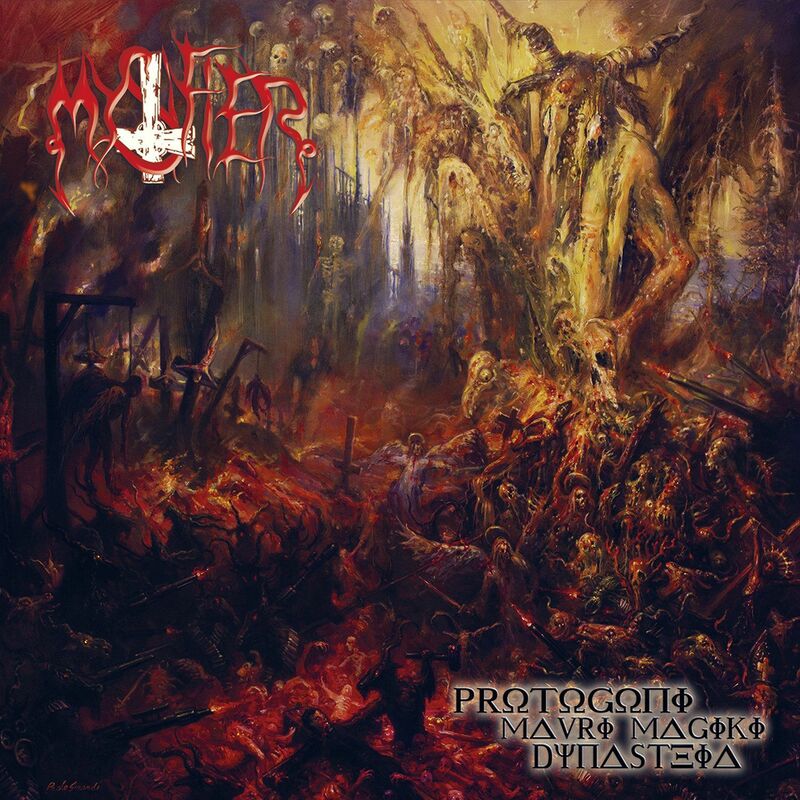 MYSTIFIER have furthermore revealed the cover for ‘Protogoni Mavri Magiki Dynasteia’. View the artwork together with the album details below. 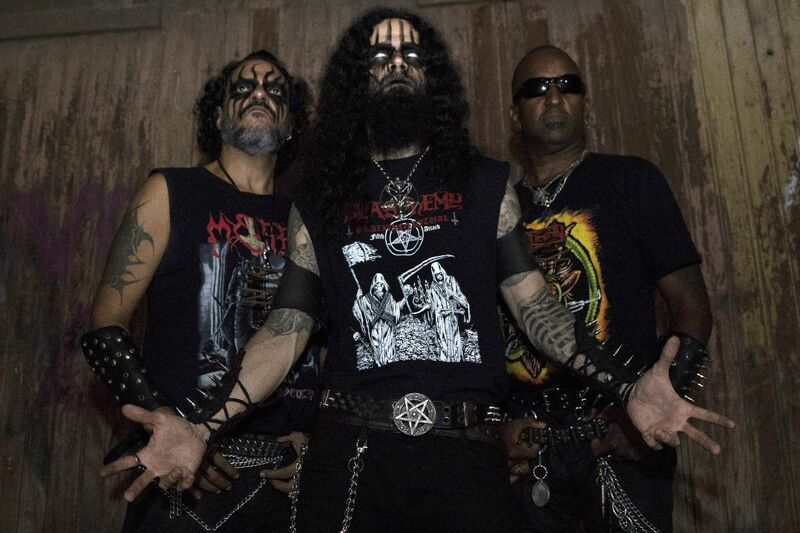 Brazilian act MYSTIFIER was formed by lead guitarist and bassist Beelzeebubth, drummer Lucifuge Rofocale, guitarist Behemoth, and vocalist Meugninousouan in Salvador, Bahia in 1989. The band created an aggressive, fast, and malignant sound within the classic black metal style, which makes them veterans of their scene. A first demo tape, which was entitled ‘Tormenting the Holy Trinity’ came out in November 1989 and secured the band several shows all over Brazil. The 7″ debut single ‘The Evil Ascension Returns’, as well as a second demo entitled ‘Aleister Crowley’, led to widespread underground recognition for MYSTIFIER in 1990. MYSTIFIER’s debut full-length, ‘Wicca’ was already released worldwide in 1992 and the Brazilians managed to cement their reputation with each following record and accompanying tour. ‘Göetia’ hit the streets in 1993, ‘The World Is So Good That Who Made It Does Not Live Here’ followed in 1996, and ‘Profanus’ came out in 2001. In the wake of the deluxe box ‘Baphometic Goat Worship’ (2008), MYSTIFIER performed at the NWN Festival ll in Berlin, Germany and several other festivals around the globe. As time went by, MYSTIFIER underwent some radical line-up changes. Vocalist Leandro Kastyphas was replaced by the exceptional Diego Sorcerer Do’Urden from INFESTED BLOOD, and drummer Alex Rocha (POISONOUS) handed his sticks over to Edward WarMonger (formerly of MEDICINE DEATH), who brought much experience and maturity to the group’s compositions.Having wrecked stages throughout South and North America, Europe and other places with several sold-out shows during the ‘Bloodshed Rituals’ tour in support of ROTTING CHRIST, MYSTIFIER are now proudly presenting their newest offering ‘Protogoni Mavri Magiki Dynasteia’!